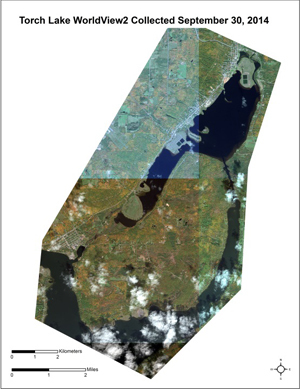 Remote sensing, including aerial and satellite imagery as well as underwater acoustic imagery, are being analyzed to quantitatively and efficiently assess both the regional extent of EWM (identifying newly invaded areas at an early stage without intensive field monitoring based on the spectral characteristics of EWM) and the local outcomes of EWM treatments, enabling managers to monitor the impacts of and improve the techniques used for combating this invader and restoring natural habitat in important coastal areas of the Great Lakes. High-resolution WorldView-2 satellite image of the Torch Lake area collected in September 2014. 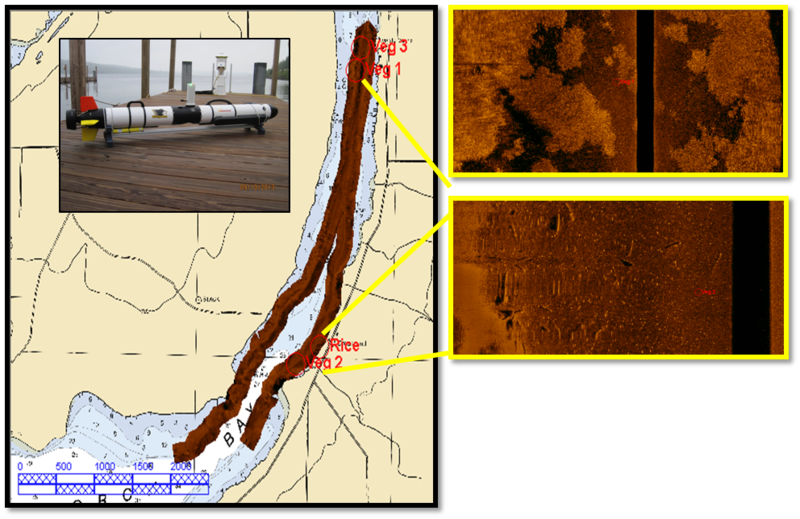 EdgeTech sonar data collected in Torch Bay in summer 2014. 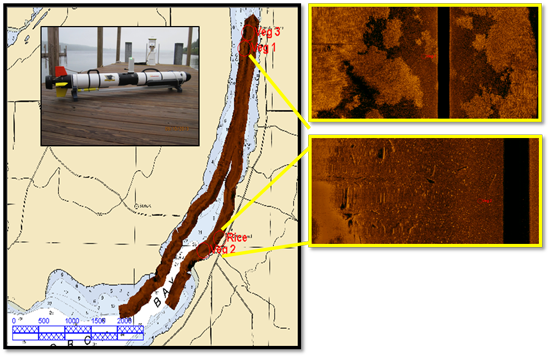 Advanced next-generation, Great Lakes numerical, hydrodynamic modeling is underway at the Great Lakes Research Center (GLRC) at Michigan Tech, utilizing the new supercomputer “Superior.” This is critical for our understanding of potential dispersal paths of EWM propagules and the water and nutrient conditions that foster EWM proliferation. 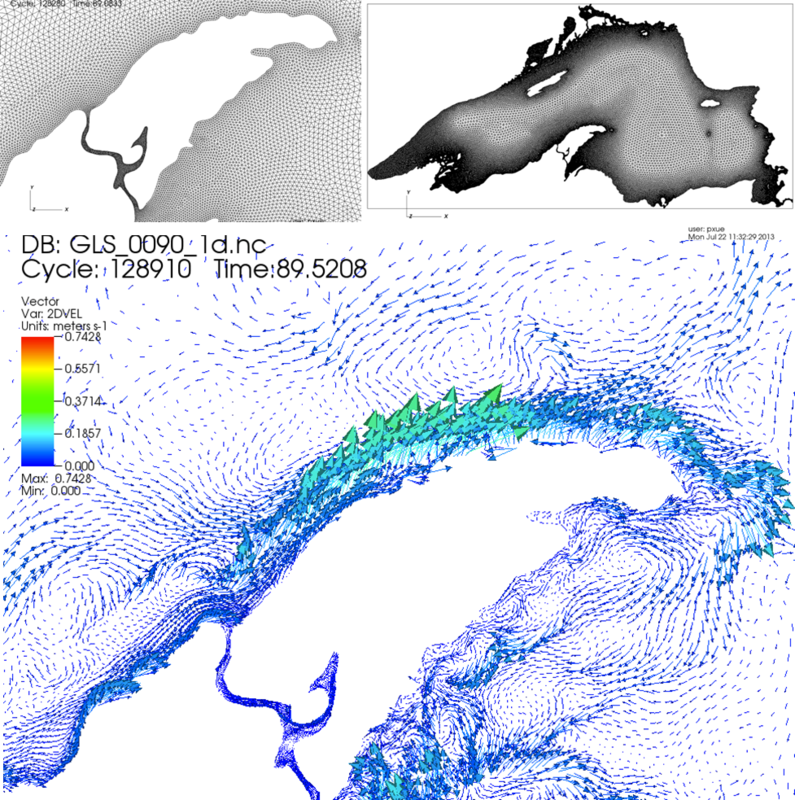 Finite Volume Coastal Ocean Model (FVCOM) high resolution computational grid operating on the new super computer, Superior, at Michigan Tech for Lake Superior. 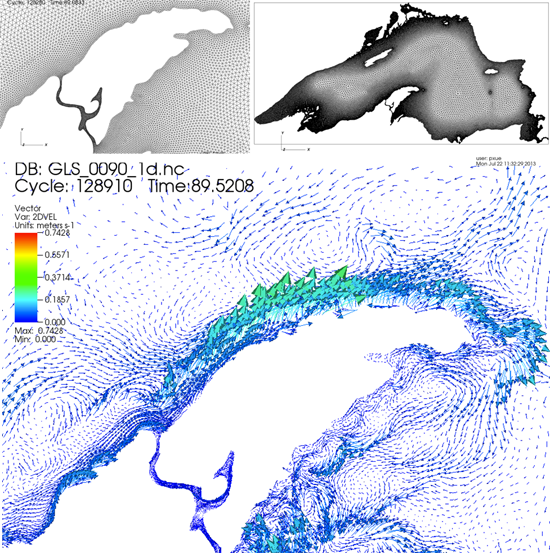 Top left: The Lake Superior computational grid; Top right: Detailed coastal grid through the Keweenaw Waterway; and Bottom: Resultant water surface flow vectors for a standard wind forcing event.